Gutter cleaning must be done at least once a year, so that you avoid clogging of your gutters and downpipes and water damage to your building. Ashlee House Cleaning has vetted, skilled and experienced gutter cleaners who can efficiently clean out any twigs, leaves and other waste. They will do the job by using telescopic pipes with attached cameras, connected to powerful dry or water vacuum cleaner. You will be provided with photos of the condition of your downpipes and gutters. This service is offered with a 1 month quality guarantee, and we will return to re-clean if they get clogged during that time. We only hire well-trained roof cleaners who can deliver high quality house roof cleaning. 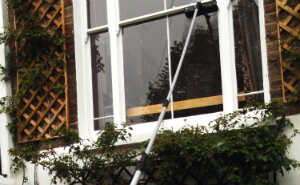 Pressure washing devices is used to rip out algae, mildew, mould, ugly stains and any moss from roofs. Your roof has to be adequately cleaned out on a regularly, so that your home looks fine, and so that no damage will occur due to debris and all the other dangerous growths on it. The problem with organisms that live on your roof is that they may destroy the roof if left untreated for long time. Our firm provides a trustworthy and cost-effective roof cleaning service, which will save you the hassle of having to climb up on your roof or on a ladder to perform the cleaning your self. Be safe, and order our fully insured cleaning service right away. For a professional cleaning of any form of gutters, windows and roofs, do not be reluctant to contact us now! We have a straightforward reservations system for our window cleaning Thurlow Park SE21 services. You can book any day of the year for your gutter, window & roof cleaning. We can arrive on the same day whenever you want an emergency service. We have fixed as well as fair fees. All clients who book more than One of our services altogether will be presented a price reduction for every added service. No deposit is necessary to order our cleaning services. We have advantageous fees for regular clients, real estate companies, property owners and for those of you who book early on. For a professional window cleaning service, do not think twice to make contact with our 24/7 customer support now at 020 3746 1366 or via our internet booking form. You will be sent written confirmation in the next Two hours.